(This brief report was written immediately after the protest on Saturday near the RSS office in Delhi. It was later published in Kafila. Here the report is reproduced with few additions made by the authors. The English translation of the Hindi quotes used here was done by Shuddhabrata Sengupta of Kafila). 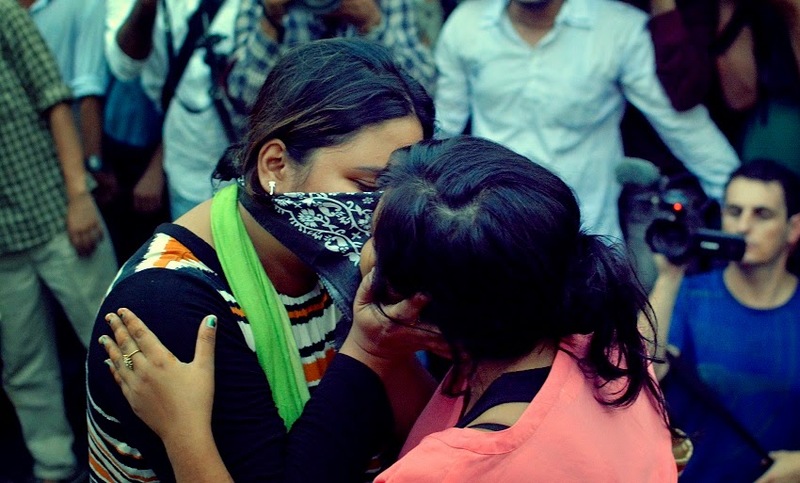 In the first of its kind in India, youth in Kochi launched a campaign called ‘Kiss of Love’ to challenge the moral policing of the Hindu Right. While that protest was attacked by right wing thugs and suppressed by the police, this form of protest has since spread to different parts of the country like Hyderabad, Bombay and Calcutta. Today, the ‘Kiss of Love’ protest was held at nowhere short of the Rashtriya Swayamsevak Sangh (RSS) head office in New Delhi. A few individuals took the initiative and gave a call for this protest on Facebook with the title, ‘Sanghi Gunde Hoshiyar, Tere Samne Karenge Pyaar’ (Sanghi thugs beware, we will love in front you). Friends this is a fake page, there is no need to take this page very seriously. Some fool has made this page to spread rumours, please do not get angry and curse people here. How can any one even think that they can dare to have the courage to do such a thing in a city like Delhi. Remember, one simple thing friends, our Delhi was a fortress of Hindutva yesterday, it is so today, and it will remain so tomorrow. Even if someone tries to do something, you will see what happens to them, so there is nothing to worry about. The venue where they say they will gather is not some ordinary plae. It is a metro station. The security of the metro station is in the hands of our patriotic CISF soldiers, Anyone doing anything slutty there will have their backsides broken. Without the CISF’s say so, not even a bird can flap its wings here. Think what fate can befall these sluts and their toy-boys. In any case, keeping all the rumours in mind, we have informed the CISF soldiers already. What else can we say – wait and see what happens tomorrow on the news channels. ताकि उन्हें भी तुम्हें पैदा करना का अफ़सोस हो." Tell the woman who gave birth to you about your last wishes before you come. And make sure to have made an advance booking for a bed in a hospital, in case you get out of here alive. And call ambulances in advance. If possible, get the people who gave birth to filth like you to come with you, so that they can regret the folly of giving birth to you." 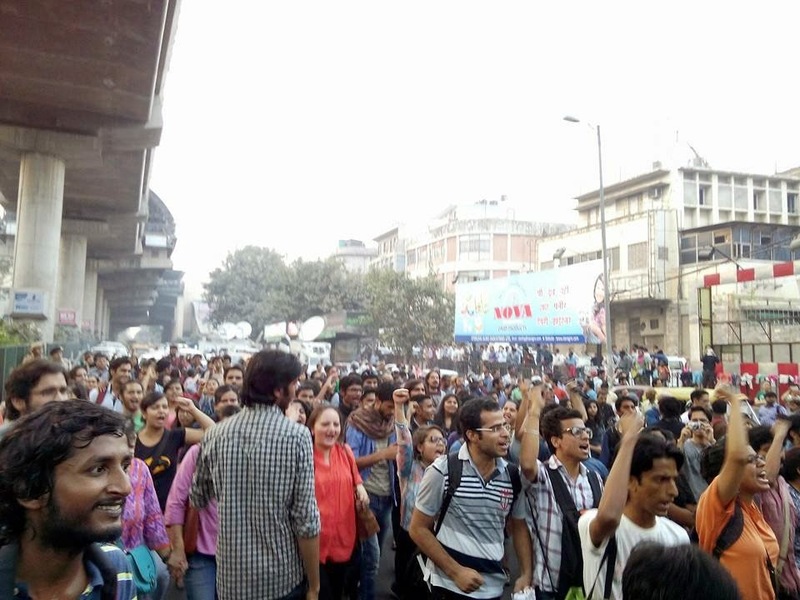 Even at such short notice 300 to 400 people turned up for the protest, including students, researchers and young teachers of Delhi University, JNU, Jamia Milia Islamia, Ambedkar University and scores of other concerned citizens. 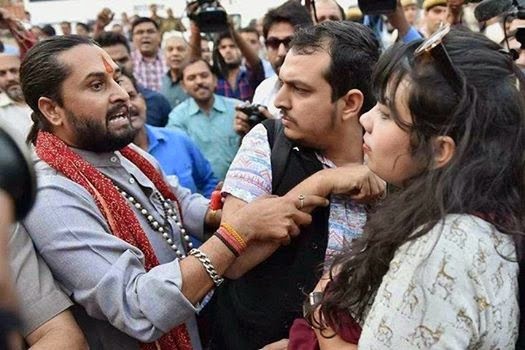 The reason this protest spread to so many different parts of the country so quickly is precisely because the Hindutva right wing custodians of ‘Indian culture’ and their aggressive moral policing have become increasingly emboldened. 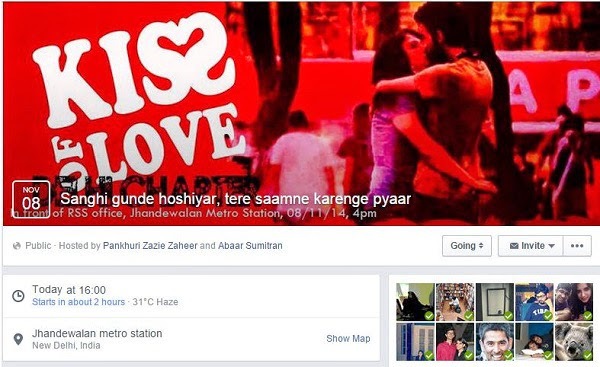 It is worth mentioning here that the ABVP, the student wing of the RSS, recently launched a campaign in the Delhi University campus against “Love Jehad” and the “menace of live-in relationships” as they go counter to “Indian culture”. 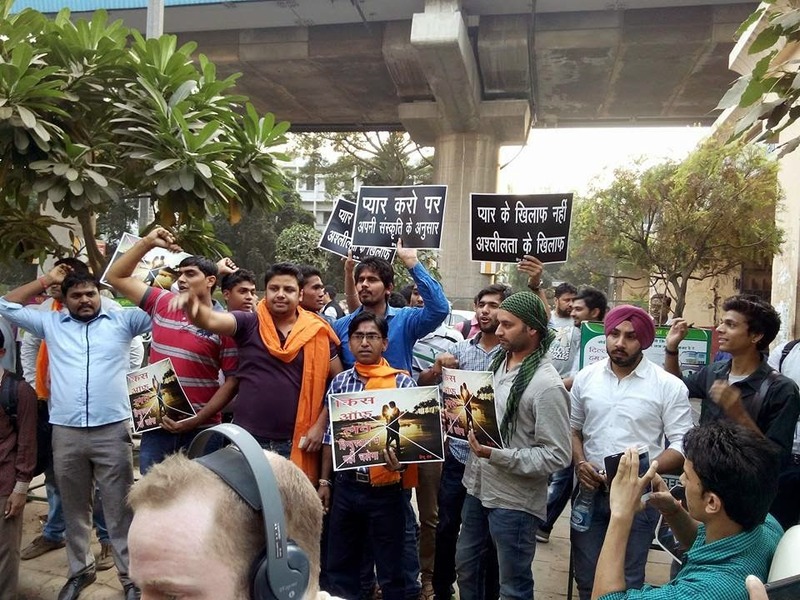 While protestors began gathering at the Jhandewalan metro station located close to the RSS office, a group of right wingers calling themselves the Hindu Sena staged a counter protest holding up slogans saying: ‘Pyar karo par apni sanskriti ke anusar’ [Love but within the limits of y(our) culture] and ‘Pashchimi sabhyata vaapas jao’ (Western culture go back), because as is common knowledge, the Kamasutra comes from Western culture. 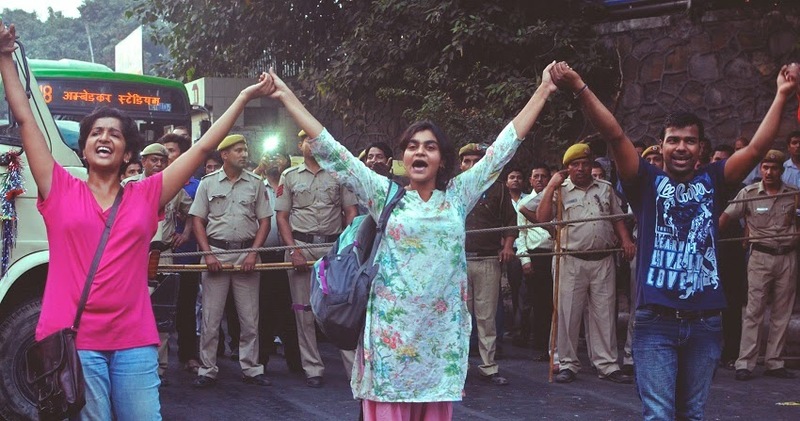 As the protestors attempted to move towards the RSS office, they were blocked off by the Delhi Police in the front. The custodians of morality came from behind at the group of protestors with growing aggression, blocking them and engaging in scuffles with protestors every now and then. 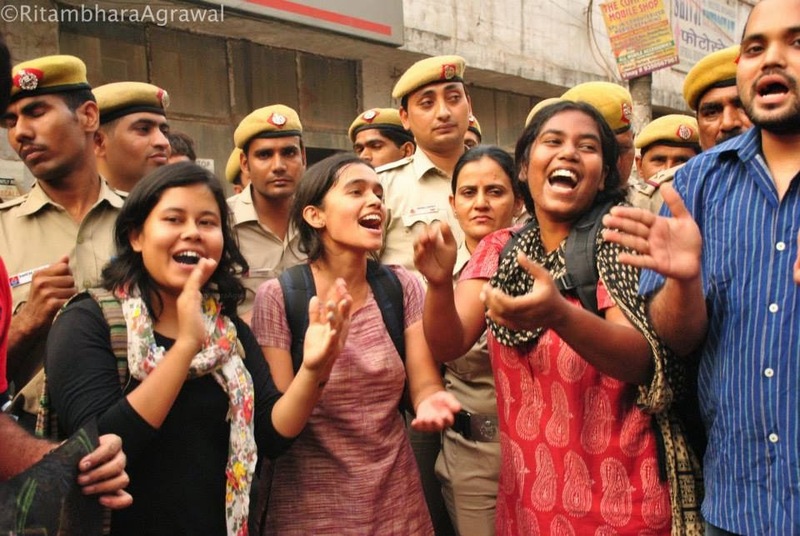 Despite aggression from all sides that continued for over an hour, protestors managed to come together to collectively sing popular songs of love like ‘Pyar kiya toh darna kya’, ‘Khullam khulla pyar karenge’ and ‘Pyar hume kiss mor pe le aaya’. A breather came for the protestors while RSS cadres retreated, and some police officials went conspicuously missing. Some of us found out that the two parties were actually locked in a discussion behind the metro station. While the RSS cadre returned in a renewed attack to enter the center of the gathering, they were pushed back out and in a surprise move, the protest quickly took to the main road. 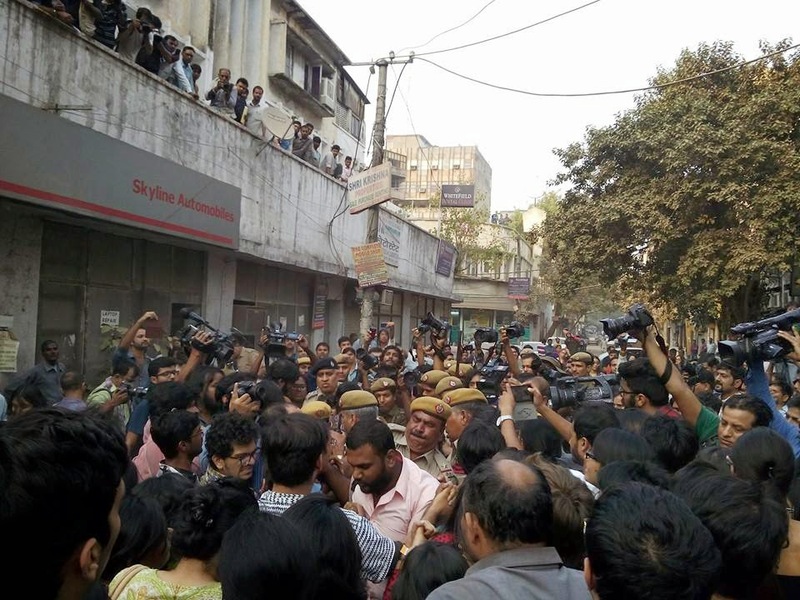 In the midst of the pushing and pulling between the police, the media, hungry for its photo of a kiss, and RSS goons, the sudden and swift move to the wide roads of Karol Bagh led to a huge round of cheer amongst the protestors. We sang, we cheered, raised slogans, held hands, clapped, and laughed as we ran past the weak human chains of the police, who for once we outnumbered. Arriving at Rani Jhansi Chowk protestors gathered to form a huge circle, blocking off most traffic at the busy intersection. Couples came together in loving embrace to kiss each other. As the programme commenced, two plainclothes men claiming to be policemen with no ID arrived in the center and grabbed two men who had just kissed and dragged them across the entire intersection when they were finally released from their grip. Despite one more raging attack of RSS goons, the protest ended with another song: ‘Woh humare geet kyun rokna chahate hain ... ... Khamoshi todo, waqt aa gaya...’ (Why do they want to mute our songs ... the time has come to break the silence). While the RSS cadres stood frustrated in one corner channelising their anger against a mere expression of love in slogans, telling Western culture to go back and what not, the protestors walked away, continuing to sing and cheer and laugh and kiss. The protest finally ended after the police forcefully escorted protestors in the long walk to R.K. Ashram metro station.